Planning on touring? Deciding what to bring may well be high up on your ‘I wonder…’ bout of questions. The majority of Celtic Rider customers decide to hire our riding gear for a few reasons. Firstly, we use a few really good brands. Macna and Oxford are our brands of choice for our jacket and pant clothing. Macna is a Dutch brand, offering summer weight, winter weight and night eye, jackets and comfortable, padded pants. Oxford is a British brand, and specializes in the design and manufacture of top quality clothing, tank-bags, waterproof roll-up bags plus many more parts and accessories associated with motorbikes. Both are water resistant to a high degree but we also offer waterproof rain gear to wear on top of these giving you maximum water resistance and comfort on your tour. We use StyleMartin boots, with a few Daytona’s thrown in there also. StyleMartin is an Italian brand, and their boots are superb for comfort, waterproof fastness and fit. Our gloves are all leather with some warm, heavyweight option alongside some lighter unlined options. Again, sizes XXS to XXXL are available. We also have over 140 helmets in stock. We offer a huge range of LS2, Schubert and Shoe. Most of our stock is modular (full face and flip up), and we also stock some open face along with a handful of full-face helmets. Sizes from XXS to XXXL are available. All of our helmets are ECE approved, which is the European equivalent of DOT. 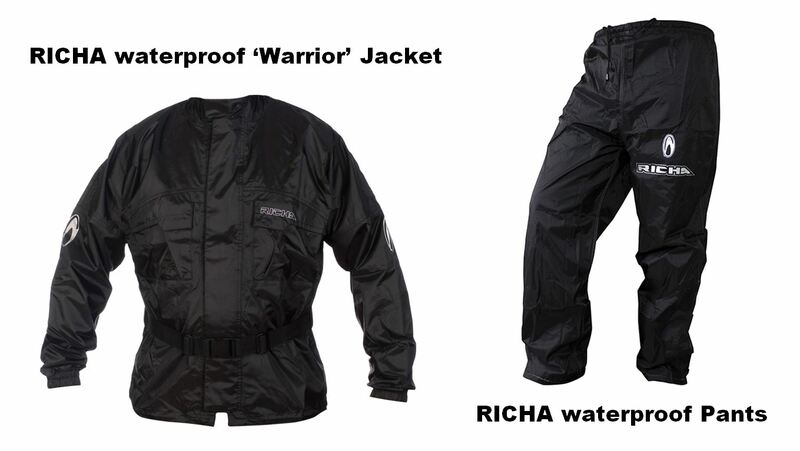 Our rainwear is top-quality Richa, with a heavy waterproof fabric elastic waistbands. This is a naturally larger garment and is worn over your riding jacket and pants. 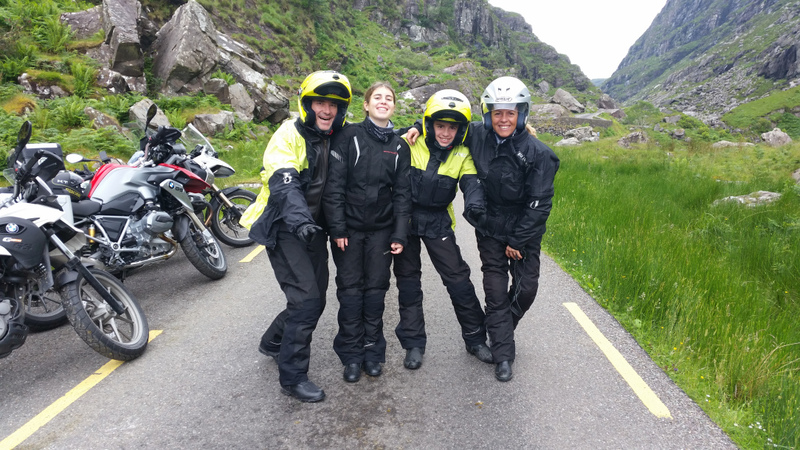 The total cost of riding gear is only €10 per day and without a doubt hiring ours saves you on hauling yours over. This can be added on to your rental at any stage.